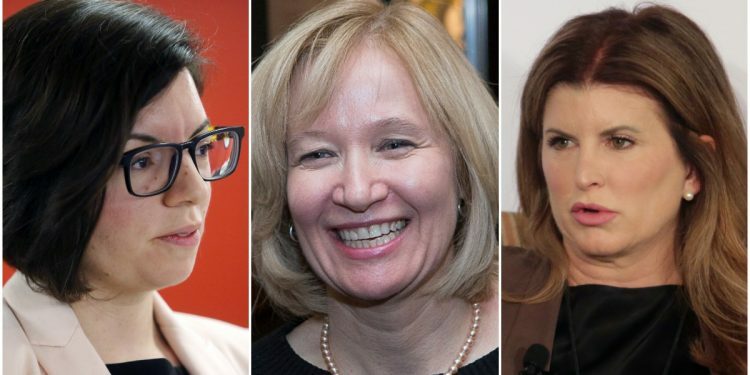 Ex-Tory interim leader Rona Ambrose and Laureen Harper are behind a new Alberta group, while MP Niki Ashton has launched an online campaign school for the NDP. Party-specific initiatives to draw women into politics are necessary and welcome, especially by members of the Conservative Party, which has fallen behind other major parties when it comes to putting women on the ballot, says the head of a national organization aimed at promoting women’s involvement in politics. In 2015, 20 per cent of the Conservative candidates were women, compared to 28 per cent of Bloc Québécois candidates, 31 per cent of Liberal candidates, 39 per cent of Green candidates, and 43 per cent of NDP candidates. Last week, former interim Conservative Party leader Rona Ambrose and Laureen Harper, the wife of former Conservative prime minister Stephen Harper, rolled out their new non-profit organization, She Leads, for which they serve as chair and vice-chair, respectively. First announced in May, She Leads, as Ms. Ambrose told a Calgary CBC Radio show on July 25, is aimed at filling the practical skills gap faced by women looking to seek public office, specifically those in Alberta as the province heads towards an election next spring. She Leads will focus on three streams, Whitney Issik, one of the organization’s directors, told The Hill Times in an interview: forming a business advisory council to advise political and industry leaders on a variety issues, through direct engagement, or as panellists at conferences, for example; recruiting women to run as political candidates and to fill other leadership roles in the political process; and creating a candidate-support network where women can turn to for advice and mentoring to fill in the gaps for those who’ve never before mounted a political campaign. The idea developed from conversations held at the start of the year between a group of politically minded friends, all of whom hold roles in or are connected to the United Conservative Party in Alberta. “We were thinking ‘Okay, there’s a gap here. How can we fill this? How can we organize around this to make some of this happen?’ recognizing that we’re heading into nomination season for provincial and also for federal [elections],” said Ms. Issik, a former national policy co-chair for the federal Progressive Conservatives who is currently running for UCP nomination in a Calgary-area riding. Joining Ms. Issik, Ms. Ambrose, and Ms. Harper on the She Leads team are UCP executive director Janice Harrington, the UCP’s caucus director of operations Jamie Mozeson, and Hill and Knowlton Strategies’ Alberta general manager Marie Rajic. Former PC MLA and Wildrose Party interim leader Heather Forsyth and former Calgary-area Conservative MP Diane Ablonczy have also come on board to lend their expertise, she said. The group has the backing of UCP Leader Jason Kenney, who Ms. Issik said wants to see more women on the party’s team. Melanee Thomas, an associate professor in the University of Calgary’s political science department, said that though she gives full credit to the group behind She Leads for tackling the issue of getting more women into politics, her “inner cynic” questions whether it’s an attempt to “rebrand” the conservative movement, and the UCP in particular, “does not look women-friendly” right now.“There are more men in Alberta’s opposition benches named Richard than there are women,” Prof. Thomas said. Conservative MP Stephanie Kusie (Calgary Midnapore, Alta.) said women are a “vibrant part of the conservative movement,” also pointing to the women who have put their names forward for the Alberta provincial race, as well as the recently elected women advancing to the new Ontario Progressive Conservative cabinet. Its website says it’s focused on giving free training sessions on campaign-related topics such as: how to be a candidate or campaign manager, media, fundraising, youth issues, issue-based advocacy, and organizing. Ms. Ashton said in an interview on July 27 that the initiative has seen “tremendous success” since launching on July 16, with 583 registrations from 413 people for the first three of seven sessions held so far. Our Movement is unique, said Ms. Ashton, in that it’s filling a gap where it not only provides resources for women who are thinking of running for office, but also encourages them to fill the other roles relating to political campaigns—particularly fundraising. “It’s clear to me there’s a huge need out there for that kind of capacity-building and that kind of support,” she said. “What we wanted to do was really profile some very strong women and non-binary folks that are doing this work and to give the opportunity to people to learn from them. And that’s something we’re seeing really interest people.” Our Movement is funded by the New Democrats (on “a shoestring budget,” Ms. Ashton said) and is run by volunteers. And while, as a web-based tool, it’s open to everyone, there is a decidedly leftof- centre focus. Outside groups like Equal Voice can’t be all things to all people, Ms. Peckford said, and having that insider connection is worthwhile, especially when it comes to navigating tricky areas, such as a party’s nomination process. Liberals began “years before the 2015 election and the result of such outreach are evident in the diversity of candidates the prime minister was able to recruit.” Since taking office, the Liberal government has been “working to increase political participation of all women, across partisan stripes and in all orders of government,”Ms. Monsef said, citing things such as Bill C-76, the Elections Modernization Act, which among other things, allows for the inclusion of childcare expenses as a contestant’s personal expenses. She also referred to “promoting leadership of Indigenous women through Status of Women’s call for proposals called Empowering Indigenous Women for Stronger Communities.” Research has shown that once women make it through the nomination process, they’re generally on track to being elected, Prof. Thomas said, making it crucial that party leaders give a directive to help overcome some of the systemic barriers for women entering the political arena. “I know I’m one of several that sounds like a broken record, but parties could solve this problem overnight if they literally just committed to nominate way more women,” said Prof. Thomas.